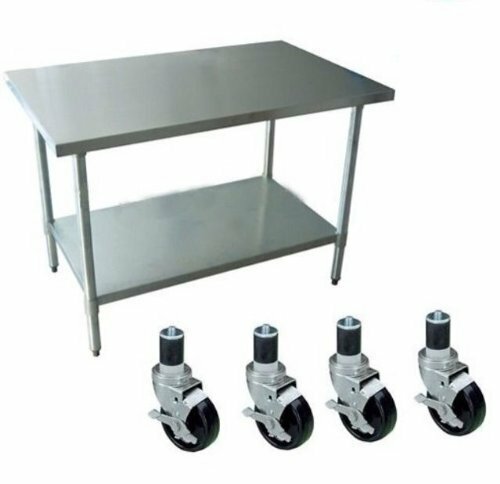 DuraSteel Stainless Steel Work Table with Caster Wheels is designed with durability as priority, perfect choice for the commercial kitchens, garage, warehouse and much more. It is constructed using 18 gauge stainless steel, providing maximum strength and rust-resistance. This stainless-steel table is easy to clean and makes for a safe and hygienic option for food preparation space in commercial or home kitchens. Tables also feature an under shelving providing more space to keep all your kitchen necessities, and additional support for the table legs for maximum sturdiness and supplied with caster wheels for mobility needs. DuraSteel worktable is NSF Approved. It is very safe to use, and is very easy to clean!